Many vegetables are best sown directly into your vegetable garden, however some plants just need too long of a growing season to be successful, especially if you live in a cooler region. These types of vegetables are best started in an indoor garden.You may also want to start crops indoors to have seedlings ready to plant out as soon as the weather is warm enough – that way you get an early start and can harvest form your vegetable garden earlier in the season. 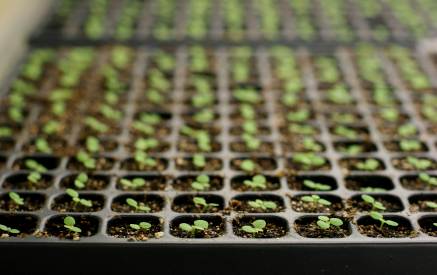 Success with sowing seeds indoors is not difficult if you take the right steps. Suitable vegetable seeds include heirloom tomato seeds, both sweet pepper seeds and hot pepper seeds, eggplants, cucumbers, squash and lettuce. Don’t start cabbages early or they will run to flower without making good hearts, but broccoli seeds are fine, since you do want it to flower. Flowering annuals like zinnias and asters are also good to start indoors. Most new gardeners make the mistake of sowing too early. You want healthy, small plants, not weak, leggy ones, when planting out. Aim to sow three to four weeks before the date of the last frost in your area. For cucumbers and squash ten days before is best. This timing allows the plants to grow for long enough periods of time in shorter growing seasons while also being strong enough to transplant without damaging roots. You can use a lot of different kinds of containers to make an indoor garden. You might invest in some cell-packs, if you are starting a lot of plants and washed, empty yoghurt containers are great for larger seeds, as long as you remember to make a hole for drainage. Never, ever sow seeds into containers that don’t drain. Place them in plastic growing trays, but don’t leave any standing water in the tray. To reduce diseases always start with new bags of soil – you can buy special seeding mixes that have the right water-holding properties. If the soil in the bag is very dry, add some water and mix well until it is just damp. When filling your pots don’t press the soil down as you go – just fill loosely and then give a gentle press after seeding. Sow two to five seeds in each pot. Larger seeds like squash can be sown singly. When the seedlings emerge pull out any extras, leaving just one per pot. Large seeds should be pressed well down into the soil but most vegetable seeds just need a light covering. Now you should firm down the soil just a little. 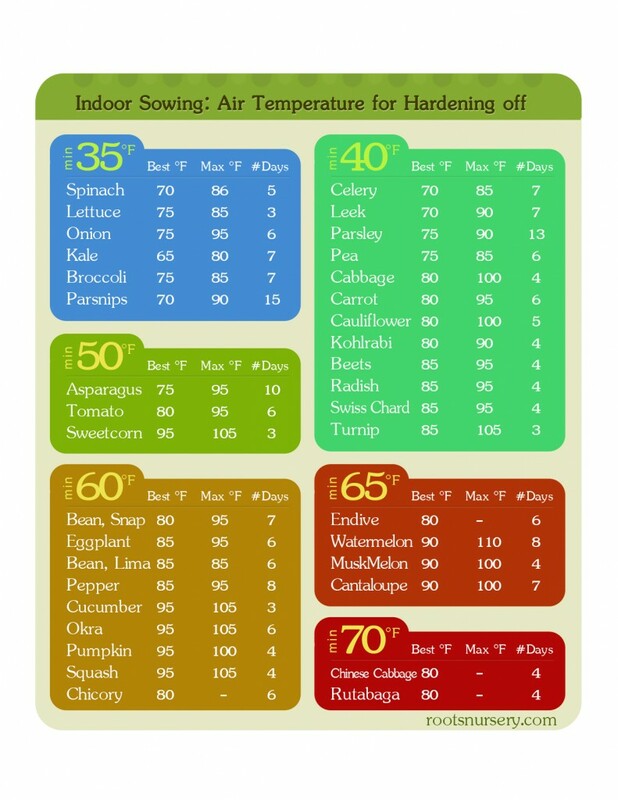 Some plants – lettuce for example – need light to germinate, but most vegetable seeds don’t so you can place them in any warm area.70o to 80o is good for most vegetable seeds. Keep a close eye and the very moment you see something emerging place the pots in the brightest light you have. If that is direct sunlight remember that you will need to pay close attention to watering as the pots may dry quickly. If you already have grow-lights then obviously these are ideal, but regular bulbs and fluorescents work well – just position the pots just a few inches below the light. It is best if you don’t have to water again until the seedlings are up, so cover the pots. You can buy plastic dome covers that fit the trays exactly, or put on a piece of glass or even uses cling-wrap. Once the seedlings are up gradually remove the dome for most or all the time. Don’t grow your seedlings in a hot, humid environment or the mature vegetable plants won’t take to life outdoors too well. Until ready for planting in your vegetable garden, feed your seedlings with half-strength liquid fertilizer once a week. Keep them in the brightest light you can and water well, but then leave them to dry a little before watering again.